Exterior of the Berrys home in Park Meadows. That familiar yet brand-new touch is in large part due to Melissa’s innate talent for interior design—a skill that’s in her blood. Her mother was an interior designer, and Melissa grew up visiting showrooms and poring over design books and fabric swatches. In 2010, Melissa opened Root'd Home on Main Street, where she both indulges her penchant for finding unique home furnishings and accessories and works with her own full roster of interior design clients. “We’ll pick your trim, your lighting, your plumbing, your paint, your window treatments. We work with the architect, the contractor. We source the hardware, the tile, flooring. We do everything and I love it,” Melissa says. Because this was one of the original homes built in Park Meadows, we felt it was important to keep the integrity of the original footprint. The Berrys moved into their Park Meadows home just before they were married in 2013. After living there together for two years, they began to pull together concepts for the renovation. Sensitive to the established aesthetic of the neighborhood, the Berrys landed on a look with a distinctively traditional feel that incorporates a contemporary twist to stand the test of time. And while the lot would have allowed ground-level expansion, they chose instead to add a second level. 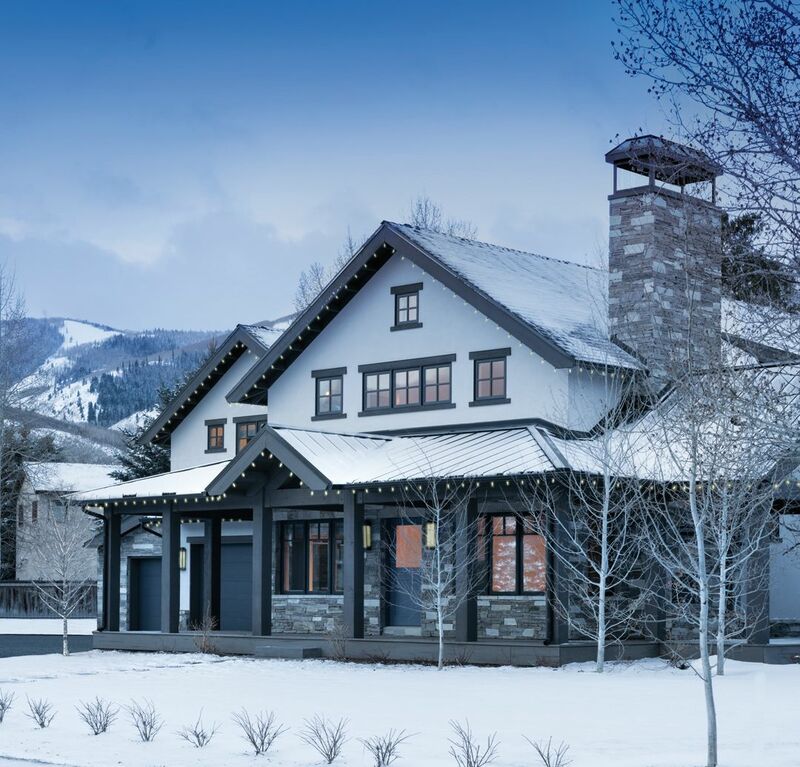 “Because this was one of the original homes built in Park Meadows and it’s something people know and recognize, we felt it was important to keep the integrity of the original footprint,” Melissa explains. Melissa chose the nursery’s “Paleolith” wallpaper because it reminded her of the mountains. The couple contracted Darin Shaw of the Shaw Design Group and John Ford of J. Ford Construction to execute their vision, which began with a completely new exterior consisting of dry-stack solid stone quartz mix in silver, gray, and white tones. Melissa chose windows framed in a deep blue-black by Sierra Pacific to add color and set the home’s Craftsman-meets-contemporary tone. The garage door, front door, and exterior ceilings surrounding the front and side porches were painted in a custom-mixed color to match the window trim. “One thing I really love is that we made the outdoor space just as inviting and livable as the interior space,” says Melissa. Indeed. Comfy grey rocking chairs and a nearly life-size golden lamb (originally intended to reside in the nursery) greets guests as the house mascot on the front porch. And the outdoor living space on the right-hand side of the house is outfitted with a 55-inch television, small wood-burning fireplace, and sectional seating by Summer Classics. A seamless transition from the exterior to inside the home begins at the Dutch-style front door, built by Dave and John Ford, which swings open to reveal an airy great room, achieved by the removal of a wall that once separated the kitchen from the main living and dining spaces. The walls here—and throughout the interior’s public spaces—are a soothing blue-gray hue. Vaulted ceilings, a loft, and a row of three high windows wash the entire space with light. The dining area features built-in seating and a custom-built table that, with the addition of a leaf, easily accommodates up to 10. “It’s casual but can easily be made formal,” said Dave. “We love it so much we use it every night.” Gray-stained white oak flooring completes the monochromatic blue-gray backdrop. The “It’s Complicated” wallpaper, from Romo Designer Fabrics & Wallcoverings, provides a dreamy backdrop in one of the guest rooms. In the kitchen, a simply designed island topped with honed granite offers ample counter space. Stainless steel appliances line the perimeter along with a clean, white, oversized subway tile backsplash. Melissa is particularly fond of the traditional gooseneck faucet over the deep kitchen sink. Brushed stainless steel hardware puts the finishing touch on Shaker-style kitchen cabinetry. Sliding barn doors hide the pantry, mudroom, and laundry room, completing the functionally modern downstairs living area. Melissa took a chance in the main level’s two guest rooms, which worked out beautifully. In the first, rich sable walls contrast a show-stopping orange tufted leather headboard and a pair of feathery metal pendant lights, hung over each bedside stand. 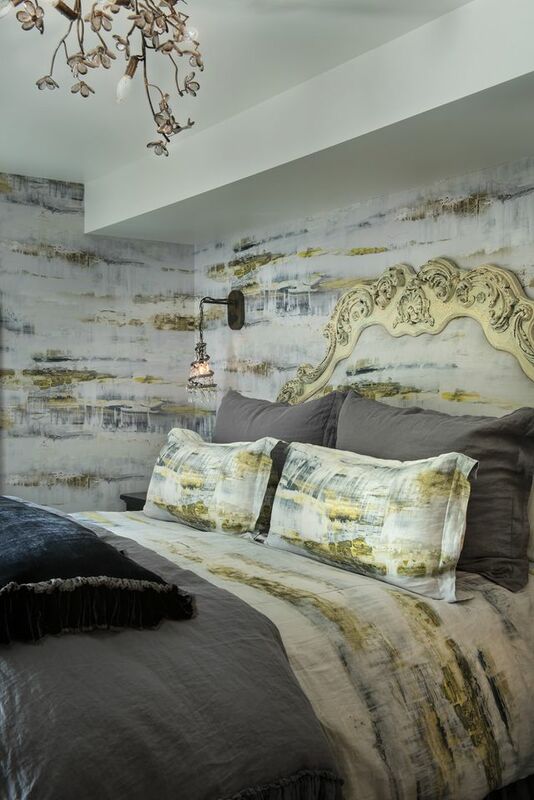 In the second, or main, guest room, walls are adorned with Romo Designer Fabrics & Wallcovering’s "It's Complicated" wallpaper—a contemporary, impressionistic pattern in shades of white, grey, and green. The bed linens and even the upholstered bed headboard are a fabric with the same pattern. The overhead light fixture was custom-made to match the walls and textiles. The Berrys’ eclectic art collection aptly reflects the family’s flair for fun. Pieces include a moose sculpture by Scott Whitaker they affectionately call “Bullwinkle” that overlooks the living area from the loft, a Native American bell jar—a gift from Melissa’s mother—that hangs over the kitchen sink, and the nursery’s whimsical three-foot giraffe sculpture wearing a feathered headdress. Most were sourced from local galleries—including Silver Queen Fine Art, Julie Nester Gallery, Gallery MAR, and McMillen Fine Art Photography—through Dave’s business, Aisling Art Installation (435.655.1322, aislingartinstall.com). Upstairs in the nursery, Melissa continues the home’s blue color scheme with a calming mix of pale sky-inspired tones anchored by Cavern Home’s "Paleolith" wallpaper. “It reminds me of the mountains,” she says. Built-in dressers were designed to match the crib railing, and the soft blue upholstered rocking chair comprises the same colors as the room’s ethereal ceiling.